At a recent microbiome conference, I learned something that has changed my diet around. Scientists have known for a while now that there is a close link between gut bacteria and our diet. And by not eating certain food groups, i.e., reducing the variety of food in our diet, we make the gut microbiome ecosystem worse. When we go gluten free or low FODMAP diet, we also take out whole wheat from our diet which can potentially lead to significant reduction in variety of food consumed. So if one can re-introduce whole wheat back in the diet, without increasing gluten content, it might make the microbiome in our guts fitter. Oh, who am I kidding. I want a good gluten free bread to go with my soft boiled eggs in the morning and I am sick of paying $6.99 for a loaf a bread. Looking through Monash University’s gluten analysis, I had further learned that spelt has less gluten that modern wheat. And sourdough bread made with spelt is nearly gluten free. 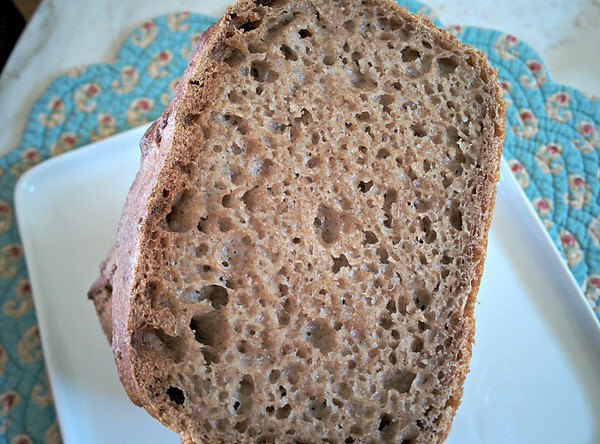 This got me thinking – while sourdough is not something I wanted to invest time and energy in, what if I could make raised loaf with sprouted wheat? I had also accidentally tumbled on a sprouted spelt flour from the excellent One Degree Organics folks (God bless them!). And in my other experimentation, I had found that sprouting made it easier to digest legumes. So, putting two plus two together, I hypothesized that if I could make a loaf from sprouted spelt, I would have a happier gut. Easier hypothesized than done, the real challenge is in the art of making bread from whole wheat. I consider Acme’s whole wheat bread to be the standard of bread making. And I had tried Bittman’s no knead recipe and failed every time – the bread would turn out wet inside. Some further research into no knead bread, led to this smithsonian article that stirred a new hope. Just one bake later, I knew I had tumbled on the right recipe. Since then I have made this bread recipe a few times. 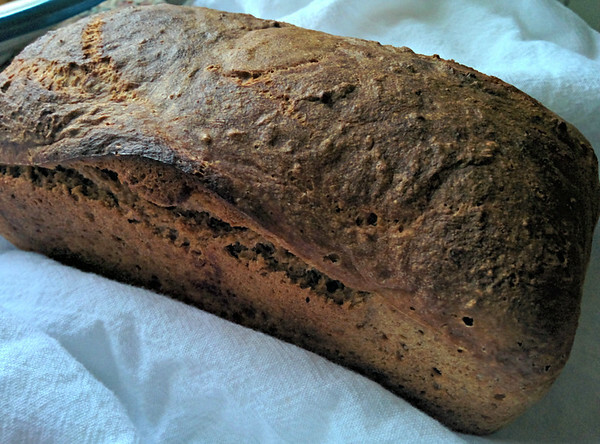 The bread turns our airy, it is chewy and moist without being wet, and most definitely not dry or crumbly. And it is significantly better than my current commercial favorite, Whole Foods prairie bread. And best of all, my stomach is happy. 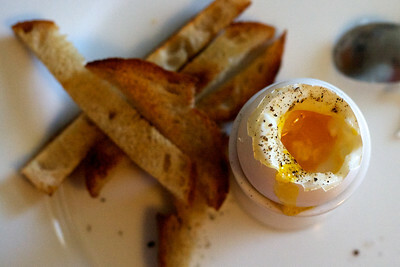 And my soft boiled eggs have a perfect companion. With my one degree organics sprouted spelt flour, I use 16 oz flour, 16 oz water, 2tsp salt, a tiny pinch of fast raising yeast (1/8th tsp), and I let the mixture rise overnight. So far, I have tried making loaf. I follow the temperature to the tee – 520F for 15 minutes, lowering to 470F for 20 and final 15 minutes with oven slighted open (at 470F). There is a problem to be solved still. The dough is so wet that it is unclear how to make slits on top. The bread is splitting along the side in this case. Addendum: Every gut is special. Please experiment with the amount you can handle. I have a very sensitive gut and it is perfectly happy with 1/8th slice of loaf made with 16 oz flour. No pain, no gain. 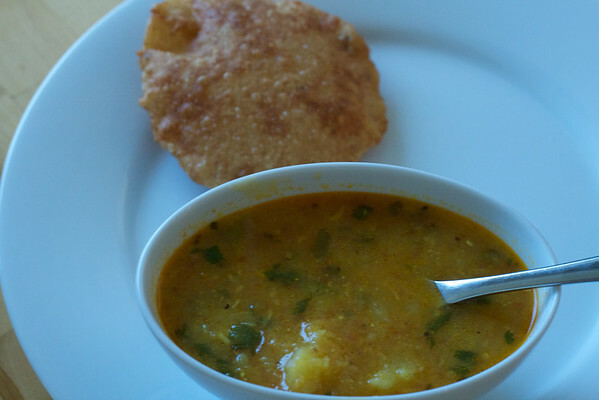 This is one of the more complex of Indian breakfasts that is better left to special occasions. Peethi: Soak 1 cup dry Urad lentil, whole or broken with no husk, overnight, grind in a food processor so it is not a complete paste with no additional water. Add 2 green chilis, 1 tsp salt, roasted and crushed black peppercorn. In a heavy pan, heat 1 Tbsp of vegetable oil. Add a pinch of asafoetida and 1 tsp cumin seeds. Cook for 30-45 seconds until fragrant and add the processed lentil. Cook until the mass becomes sticky dough like. Let cool. This can be made upto a couple days in advance. Potato curry: Peel and chop one large Idaho potato, in 1.5 inch cubes. In 1/4 cup water, add 1 tsp turmeric powder, 2 Tbsp sour yogurt and 2 Tbsp of tomato paste and make into a smooth paste. In a pressure cooker, heat 1 Tbsp oil. Add 2 whole red peppers, 1 tsp dry urad daal, 1 tsp mustard seeds, 1 tsp cumin seeds until they splutter and add the tomato-turmeric paste. Stir until fried and add the potato pieces. Stir to coat, add 1 tsp salt and add 2 cups of water. Pressure cook at medium for 5 minutes after the pressure builds up. Switch off and wait for pressure to subside. You can keep like this this for upto two days. When ready to eat, warm up, crush some of the potatoes with the back of your spoon, adjust for salt and add 2 Tbsp of chopped coriander leaves. Poori dough: Take 2 cups of whole wheat flour, add 1 Tbsp vegetable oil, 1 tsp salt and necessary water to make into smooth dough. Let rest until ready to use. 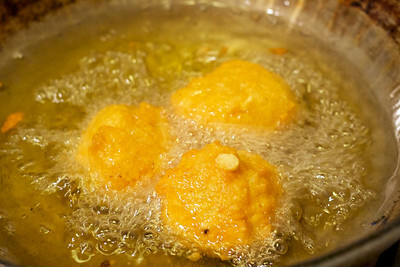 Heat oil for deep frying and maintain temperature while you roll out the poori’s. Now get ready to put together the meal. Following recipe serves two. Start with 2 packed cups of greens. 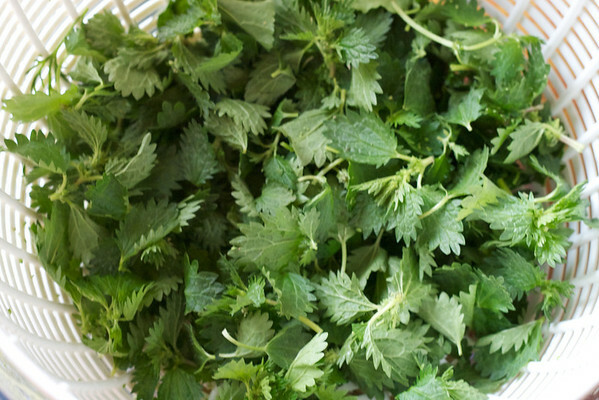 In principle you can use a variety of greens including spinach or arugula but I chose nettles because that is what I had at hand. Wash and spin dry. 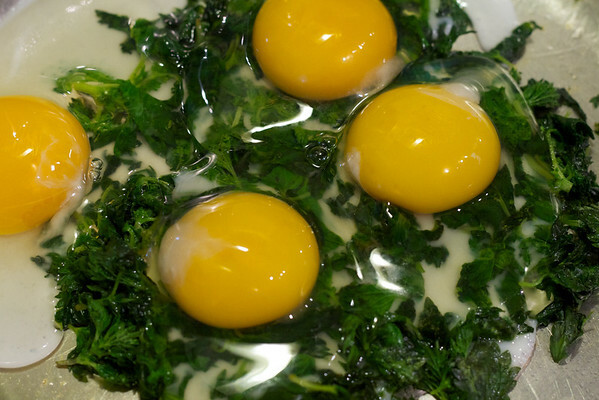 In your favorite omelet pan on which eggs don’t stick, add 1Tbsp butter and nettles. Sprinkle a pinch of salt. Cook until barely wilted. 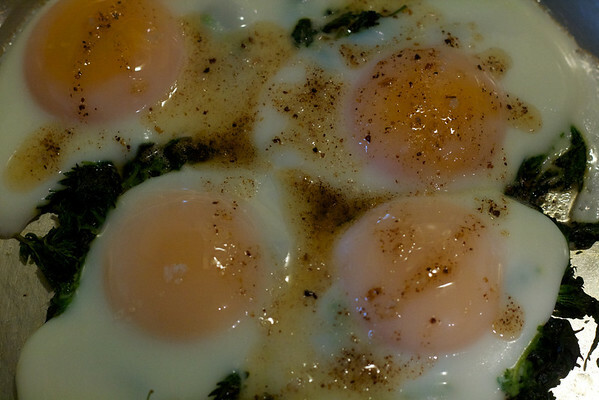 Break open four eggs, gently. In a separate saucepan, clarify 1Tbsp butter and fry a pinch of ground spices (seeds of one green cardamom, 4 whole black pepper kernels, 2 allspice kernels). Add this to the cooked eggs and serve. These Spanish peppers have caught on in San Francisco Bay Area. Last few years they were expensive and scarce at the farmer’s market, a small basket for $5. This year, our neighborhood Asian market has a large bag of these for $5. 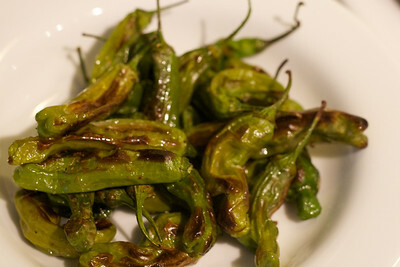 Last year, I fried these peppers in oil until blistery. This year, I got lazy and decided to push these under the broiler. Surprisingly enough, they came out at least as good as fried if not better. This is one of the great street foods of Delhi – daal pakodas (fried lentil balls) served with grated radish and carrot and topped with chutneys. Like a small plate of chaat, this is a multi-dimensional exploration of tastes and textures. The pakodas are crunchy and the lentil is tangy. 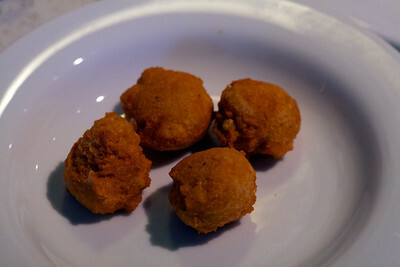 The pakodas are neither too dense nor too fluffy and provides a nice bite. 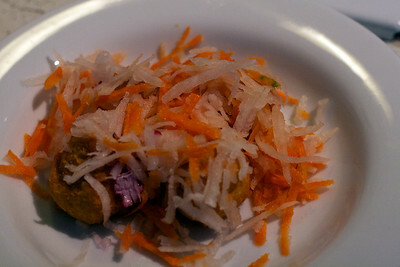 Grated radish and carrot adds a refreshing crispness. 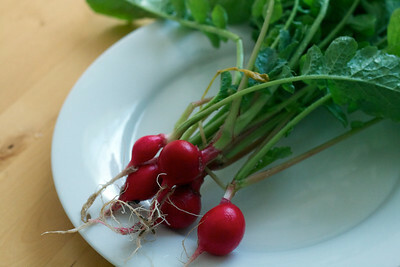 Horseradish overtones and bitterness of radish and sweetness of carrots adds to the dimensions of taste. Coriander/mint chutneys are savory, tart, and gingery. Tamarind chutneys bring the taste of molasses, and dates. Start with a dozen tender okra. Wash and dry thoroughly. Prepare a mustard oil bath for frying – 1-2 cups depending on your fryer. 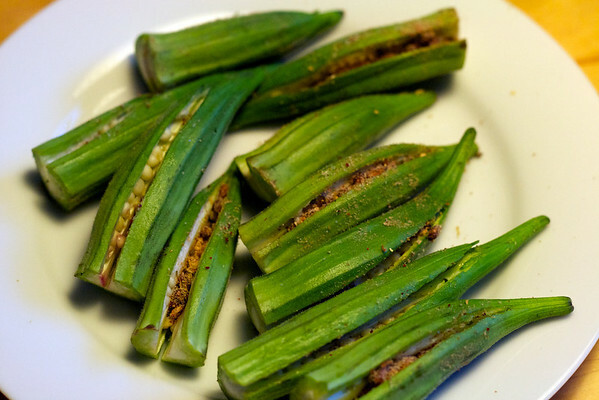 Coat the okra in batter, a few at a time, and fry until golden. Drain on a paper towel and serve with chutney.